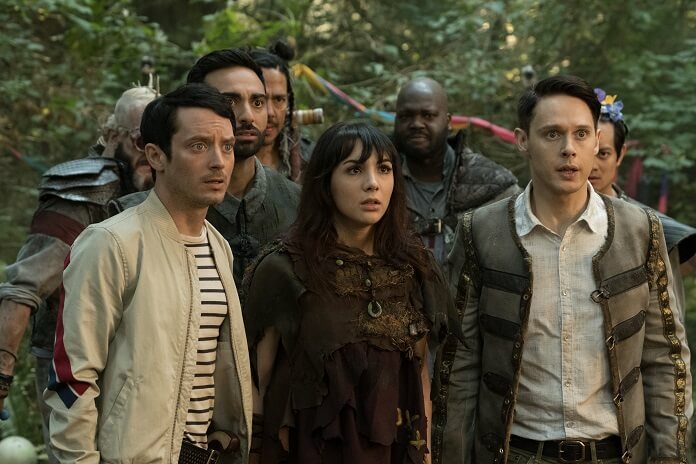 Season two’s penultimate episode of BBC America’s Dirk Gently’s Holistic Detective Agency kicks off with a flashback of a young Arnold Cardenas walking through the house after his mother murdered his father and then was sent off in a flying car, courtesy of his little brother. He stares at a business card with just a phone number and then decides to call the government and have his younger brother taken away. As the agents grab the boy in his bedroom – the same room that teleports Panto from Wendimoor and Dirk and Todd to Wendimoor – all hell breaks loose. He has a seizure as the lights in the room burst and then he slips into a coma. Off to Wendimoor we go and Queen Suzie (Amanda Walsh) thanks Dirk (Samuel Barnett), but also calls him a moron. She can’t believe The Mage was scared of him, and she threatens #TeamDirk with her wand. Before she can speak, Wygar Oak (Aleks Paunovic) grabs her from behind, clasping his hand over her mouth. Wygar warns them the Trosts are about to attack, and Amanda (Hannah Marks) sends Silas away to help his family. She promises they will fulfill the prophecy. As Amanda, Todd (Elijah Wood), Dirk, and the Rowdy 3 take off to find the boy, Wygar forces Silas to flee and takes on Queen Suzie. She threatens him, claiming no one will ever tell her what to do again. She uses her powers to kill the much more physically powerful Wygar. The Kellum knights arrive and inform their Queen they’re assembled for war. She doesn’t want the knights to worry about #TeamDirk as they’re insignificant. She’d rather have the Dengdamors and Trosts killed, mostly because she’s sick of them. Over at Blackwing, Ken (Mpho Koaho) warns everyone to be wary of Project Lamia. She’s dangerous if provoked. Friedkin (Dustin Milligan) enters his office and can’t find Project Lamia who can change into any inanimate object. Ken tries to explain that Friedkin will never be able to shoot Project Lamia/Mona Wilder, and then Friedkin gets completely confused and believes Ken might be Mona in a different form. He’s about to shoot Ken when Ken realizes the gun Friedkin’s pointing at him is likely Mona Wilder! Ken’s actual gun is still in his holster. Mona transforms into a metal chain and wraps herself around Friedkin’s neck. Ken explains to Mona that no one wants to hurt her, and they understand why she helped Dirk escape. He also reveals they think Dirk’s in trouble and pleads for her help. Mona (Alexia Fast) changes into real human form. Tina (Izzie Steele) and Farah (Jade Eshete) wake up on the hill above the quarry and watch as Sheriff Sherlock Hobbs (Tyler Labine) carries supplies into a car The Mage (John Hannah) is leaning on. Farah is forced to stop Tina from screaming for her friend, explaining Hobbs is enchanted. Farah’s determined to stop this and save Hobbs, but they need a plan. The plan they come up with: they’re going to arrest The Mage. However, before Tina makes it to the car, she passes out. Over at the Cardenas place, Mr. Priest (Alan Tudyk) assembles his Blackwing soldiers. He calls in to headquarters and tells Ken he needs his expertise. Why? Because he sees Panto (Christopher Russell) and Bart (Fiona Dourif) walking up the road. Bart warns Panto that these people want to capture her, and Panto swears he’ll protect her. She tells him these people are dangerous and he reminds her he’s the greatest swordsmen in Wendimoor. Mr. Priest instructs his team to put their weapons down since the guns only give Bart a reason to kill them all. Mr. Priest and Bart exchange greetings and she explains she just wants to get to Wendimoor for the happy ending. Panto introduces himself as a normal man from this world, and Bart asks Mr. Priest if he’s going to let her into the house. Mr. Priest assures her she can do what she wants, but then holds up his tablet showing Ken at Blackwing. Bart and Ken are ecstatic when they see each other. She asks how he got into this little square and he explains he’s at Blackwing and is okay. She wants to break him out, but he assures her she doesn’t need to. Instead, she needs to turn herself in. She describes Blackwing as the most boring place ever, and then claims she doesn’t even kill anyone anymore. Ken tells her missed her as Panto watches, alert for any trouble. Ken wants her to trust him, but she says Panto is her friend now, too. Mr. Priest also wants Bart to turn herself in, saying – with a sharky smile – that he’s her friend too. Bart doesn’t believe it. Bart apologizes to Ken, hands the tablet back to Mr. Priest, and picks up her chainsaw as Panto draws his giant scissors. Mr. Priest tries to stop her but Panto tells him to stand aside. A fight breaks out between Panto and a few of the Blackwing soldiers. Mr. Priest yells for them to stand down but they don’t listen. Panto takes them all down and then Bart assures Mr. Priest they don’t want to kill any more people. Mr. Priest says he can’t let them go to Wendimoor. Bart says, “Panto,” and Panto stabs Mr. Priest in the face with the scissors as Bart laughs. Mr. Priest continues to tell his men to stand down after being stabbed. Bart asks Ken if he still wants to go to Wendimoor. He pleads with her to come to Blackwing, but she just lets him know that if he changes his mind, he should tell her. Bart kisses the tablet and then she and Panto enter the house. Panto’s attack would have killed Mr. Priest – if he was a normal human. In Wendimoor, Dirk explains the pool in the throne room leads to the bed in the Cardenas house. The Rowdy 3 add that they were also pulled through water to get to Wendimoor. The throne room pool might work the same way as Wakti’s, and Amanda thinks she might be able to reach through the pool to find the boy in Blackwing. Unfortunately, she’s not sure where the boy actually is inside Blackwing. Dirk suggests Amanda send him and the Rowdy 3 back to Blackwing as a strike team. Todd is completely against this idea, believing the team should stick together and take down Suzie. The Rowdy 3 sort of agree with Todd, and then suddently Todd has an attack of Pararibulitis. He thinks barbed wire is wrapped around his leg and before the Rowdy 3 can help him, Amanda tells Todd he can use this as a training exercise. She tells him to make the barbed wire real and pull it off his leg. “You own this. You control this,” says Amanda. Todd makes the barbed wire real, just as Amanda told him to, and unwraps it from his leg. Over at Blackwing, Friedkin (backed by four guards) talks with Mona. She apologizes for hurting his neck, admitting he was scaring her. She adds that the guards are scaring her now, and Friedkin explains they’re only there because she might turn into a bear or something. “Why would I turn into a silly little bear? If I wanted to kill you, I’d just turn into an aircraft carrier right now and this entire place would be destroyed,” says Mona. Ken wonders why she sent Dirk away and she claims she just did what the voice said. The voice told her she needed Dirk to find her friend, a boy. The voice believed if she could use Mona’s eyes, she could put people where they needed to be. The voice saw what Mona saw. Mona wonders if this information helps Dirk, and Ken assures her it did. She agrees to stay a person a little while longer. Back in Wendimoor, Bart can’t believe the moon looks like a smiling man. She calls Panto weird since this is all normal to him, and he tells her to imagine how he felt in her world. Bart wants to go the opposite way Panto is headed and she asks if they can. Panto doesn’t want to as it’s the opposite direction from his home. Suddenly, Silas emerges from the bushes the direction Bart wanted to head. Panto and Silas run to each other and kiss. Both immediately blurt out that they’ve found Dirk Gently, and Silas reveals The Mage’s apprentice has also arrived in Wendimoor. Silas and Bart finally speak, and Bart calls Silas’ mom an a**hole. Silas admits the situation has gotten worse and they have to convince his people to lay down their arms. Queen Suzie uses her wand in the pool and cackles because she’s found the boy. All she needs to do is send Lord Triangle Badevil (Christian Sloan) and the knights to her world and kill the boy. She thinks it won’t be tough because she’ll send them through the pool to her world and then they’ll just kill everyone they see until they locate the boy. Rapunzel the Corgi (Bentley) wakes up with a start on Ken’s bed. The shower turns itself on and Rapunzel whines and races from the room just as Lord Triangle Badevil steps out of the bathroom. Friedkin follows close on Ken’s heels, confirming he’s completely confused. Ken explains Project Moloch can build things using nothing but his mind. He created the fun house inside the Cardenas house and the file indicates Project Moloch had planned to build the fairy tale land, Wendimoor. Ken believes Project Moloch actually completed creating that world and that’s what put him in a coma. Friedkin remains in his usual state of confusion. The knights head down the hallway, bullets bouncing off their armor. They’re armed with scissors and kill many of the Blackwing soldiers. Back in Bergsberg, Tina’s made it into the quarry and yells for The Mage to put his hands up. Farah shoots at him, emerging from her nearby hiding spot, but The Mage easily stops the bullet with his wand. He taunts them, calling their plan dumb and saying Farah’s always been a disappointment. He uses his magic wand to make Farah and Tina aim their guns at each other, and then decides to be mischievous by letting them put their guns down. The Mage explains Hobbs is currently loading explosives into the car so he can drive it into the Cardenas’ house and blow it up. That will destroy the ability to get to Wendimoor. The Mage instructs Hobbs to aim his gun at Tina and he immediately obeys. The Mage cheers him on, saying he loves to strike out at people in person. Tina and Farah beg Hobbs to put his gun down, but he’s completely under The Mage’s control. A gunfight breaks out with Hobbs shooting Tina and Farah, Farah shooting Hobbs, Tina shooting Farah (against her will as The Mage waves his wand), and Farah shooting Tina. The Mage then has Farah place the gun to her head but there aren’t any more bullets. The Mage uses his wand to make Tina aim at Farah, but Farah’s able to grab the gun and shoots the wand out of The Mage’s hand. The Mage is incredulous since no one in Wendimoor can defeat him. Farah uses the next shot to make the car explode. The Mage is hurt by the explosion. Hobbs is injured but alive and now he’s freed from the spell. Tina and Farah are alive but also badly injured. The wand lands in pieces by Farah. Silas and Panto arrive in town in time to see Silas’ mother, Frija Dengdamor (Karin Konoval), and Panto’s father, Jeppum Trost (David Allen Pearson), about to kill each other. They’re surrounded by dead members of their communities. Jeppum can’t believe his son is alive, and Panto begs his father and Lady Frija to help them save the valley of Inglenook. Silas admits to everyone he loves Panto. “If there’s to be any hope for a future in this land, you must wake up and stop this, please,” says Silas. Jeppum can’t believe how many have died, but Panto assures him they won’t have died in vain if they work together to stop this madness. The Kellum knights pick that moment to arrive, laughing over the fact there aren’t many people alive left to kill. They shoot Silas, Panto, Jeppum Trost, and Frija Dengdamor. Silas and Panto die with their hands almost touching. Bart cries out for Panto and then stands to face the knights. Of course they shoot at her and, of course, none of the bullets come close to hitting her. She picks up the chainsaw and turns it on. #TeamDirk arrives at the pool in the throne room and Amanda thrusts her arms into it. She screams as the water turns colors and bubbles. She can’t keep it open by herself and tells Dirk she can maybe get him there, but he’d probably be stuck there. Amanda then grabs Todd and insists he can use his energy to help her. Dirk’s girlfriend – or as Vogel calls her, Rainbow Monster – warns them Suzie is coming. Todd quickly agrees to help his sister, but that means he can’t go through the portal to help find the boy. The Rowdy 3 volunteer to go take on Suzie, which leaves just Dirk to go through to Blackwing. Dirk says he’ll do it alone as they hear Suzie nearby. Dirk begins one of his lengthy rants and Todd cuts him off midstream, assuring him he can handle this. Amanda and Todd open the portal and Dirk stares at it but doesn’t move. The Rowdy 3 hear Suzie laughing in the woods. We’re shown quick clips of the knights in Blackwing killing the soldiers and a replay of Hobbs falling after the car explosion. Tina and Farah are either dead or close to it, passed out on the ground feet from Hobbs. Amanda and Todd scream and Dirk, finally, tells himself not to panic as he jumps into the portal.